Spray 3- to 4-quart slow cooker with cooking spray. In cooker, mix salsa, garlic, chili pepper powder, salt and cumin. Cut beef into 3x1/2x1/2-inch strips; stir into mixture in cooker. Add onion and bell peppers to beef in cooker. Increase heat setting to High. Cover; cook 30 to 45 minutes longer or until vegetables are crisp-tender. Meanwhile, in medium bowl, mix relish ingredients; set aside. To serve, wrap tortillas in damp microwavable paper towels; heat in microwave on High 1 minute to 1 minute 30 seconds or until warm. 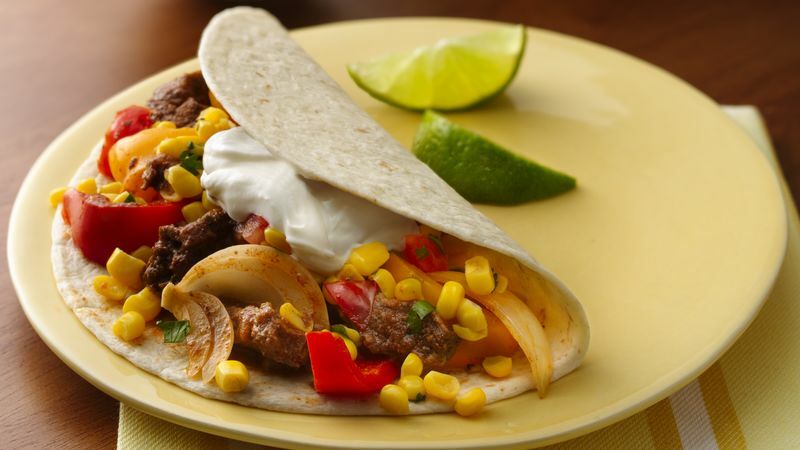 Spoon about 1/2 cup beef mixture down center of each warm tortilla; top with relish and sour cream. Fold 2 sides of tortilla over filling toward center. Serve with rice and fat-free refried beans. If you like your fajitas with a little more kick, use fiery hot salsa in the recipe.